The first Prairie style home Frank Lloyd Wright designed was in River Forest, Illinois, in 1893. This Winslow house is much closer in mass and style than the later Prairie style homes for which Frank Lloyd Wright is better known. 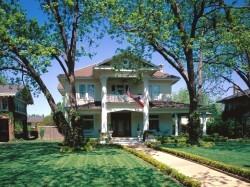 A front door and side lights, horizontal bands of trim separating floors and wide roof overhangs are found in the Prairie style interpretations that swept across the Midwest and certainly in Dallas between 1905 and 1920. The Prairie box or American Four Square is often just that. 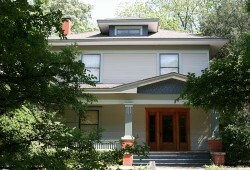 A basic symmetrical home with a gabled or hipped roof. 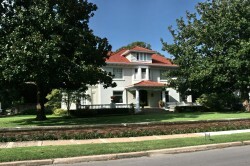 The front porch is generally the full width of the house with square, not tapered, columns often supported by horizontal half columns. The soffits are flat and closed and the exterior siding has a horizontal course line if it is brick or wood teardrop siding if it is a frame to give a horizontal shadow line. 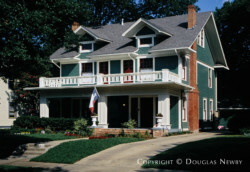 Wide double horizontal bands of trim are found on both the first and second floor. Many of the homes have gabled dormers. From this basic pattern Palladian dormers will give it a Mission look or classical columns will give the home a neoclassical flavor. Sullivanseque trim or geometrical patterned windows can give a home a more refined Prairie style appearance. These homes remain, however, simple designs with double passageways and large double-hung windows, providing an open floor plan and plenty of light. While they were built for only a short period, they are very accommodating to a contemporary lifestyle.